A new survey suggests that a significant majority of those questioned want bigger fines for speeding on Britain’s roads. An online poll of 2,680 people for the road safety lead for the Association of Police and Crime Commissioners found 85% were in favour of “more stringent enforcement of road traffic laws, with 80% wanting stiffer penalties for those caught speeding. 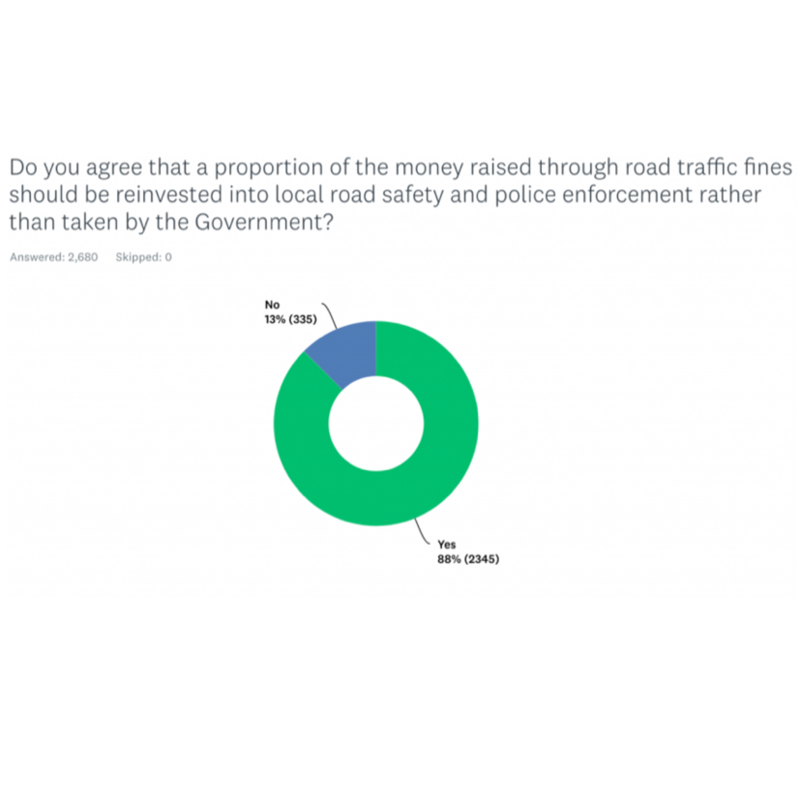 88% of those who responded agreed a proportion of the money from fines should be used for road safety initiatives and enforcement. Road Safety Lead Alison Hernandez, who is PCC for Devon and Cornwall, said, “Far too many lives are being risked or ruined due to inconsiderate, dangerous drivers who have a blatant disregard for their own safety and that of others when they ignore the law. “The results of this survey send a clear message that road safety is important to our communities and they want to see more rigorous enforcement of our traffic laws. “All of the money generated by fixed penalty fines and other motoring offences goes to HM Treasury – not to the police, councils or highways authorities whose job it is to keep our roads safe. I don’t think this is fair. “Also, the level of fixed penalty notice fines for some offences is out of kilter with the harm caused. “The penalty for those caught using a handheld mobile phone while driving doubled to a £200 fine and six points last year, and the maximum fine for those admitting littering from a car rose to £150 – yet the fixed penalty charge for speeding remains at £100 and three points. I agree that speed limits must be more strictly enforced, but only after they have been set properly. At present many speed limits are out of date as everyone knows when travelling on motorways, where the maximum speed should be raised to 80 mph (similar to the Continent) and enforced. And local speed limits need to be corrected where many speed limits that are either too high or too low. Having poorly set speed limits discredits them all, which is no good to secure driver cooperation. I agree with David. Many speed limits are out-of-date but also many have been introduced on “political” grounds because some councillor has made the astonishing prediction that “there is an accident(sic) waiting to happen” along a particular section of road. This has almost become the norm since the DfT published what in effect was a very watered down and easily distorted revised procedure for allocating speed limits. Having inappropriate speed limits detracts from their credibility and drivers consequently lose respect for them. A classic example of this is the widespread practice of painting 20mph roundels on carriageways and expecting motorists to immediately reduce their speed by 10mph for no apparent reason. Speed limits need to relate to the road environment and if there is no obvious change in terms of width, texture, footfall, adjacent buildings or frequency of junctions then they become an object of ridicule. Speed limits are set on the whims & fancies of local councillors, so therefore are meaningless in the real world. A road can have many ‘safe’ speeds dependant on PREVAILING conditions. All Awareness Course money goes to councils and private companies run by police, ex-police and those that have worked in the speeding fine industry, None will go to the police that you pay your rates for. Many people want speed cameras and the like down THEIR road and sign a ‘survey’, but are not so keen on them, when out on a journey down somebody else’s road! DFT statistics back that fact up.